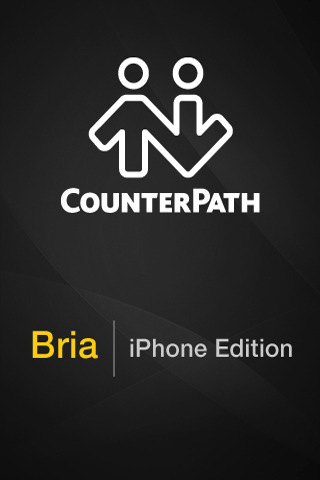 CounterPath, the market leader of desktop and mobile VoIP software products and solutions brings you Bria, iPhone Edition. Bria is an open standards, SIP-based softphone for the iPhone and iPod touch. Bria iPhone enables you to securely connect and communicate easily and efficiently whether for business or personal use. Bria iPhone provides you with superior security settings over other iPhone VoIP products. Even more, Bria iPhone provides an intuitive interface for multi-call management including the ability to swap, merge or split between two calls as well as supporting attended and unattended transfers. With Bria iPhone Edition, you can use a Wi-Fi or 3G connection to make and receive calls, or use your iPod touch as a Wi-Fi phone. ★ Headphones (no microphone): Bria uses the ear-piece on the headphone and the built-in microphone on the iPhone. Bria iPhone edition is a softphone product and not a service. You must use Bria with a SIP-based VoIP service or SIP-based server (e.g., IP Centrex or IP PBX) in order to use this product. Please contact your service provider or IT support for more information. Some mobile network operators may prohibit or restrict the use of VoIP functionality over their network and may also impose additional fees, or other charges in connection with VoIP. You agree to learn and abide by your cellular carrier’s network restrictions. CounterPath Corporation will not be held liable for any charges, fees or liability imposed by your carrier for use of VoIP over 3G. Fixed Dialing Numbers with – and .